Everything was fine! I felt very comfortable. Thank you very much! 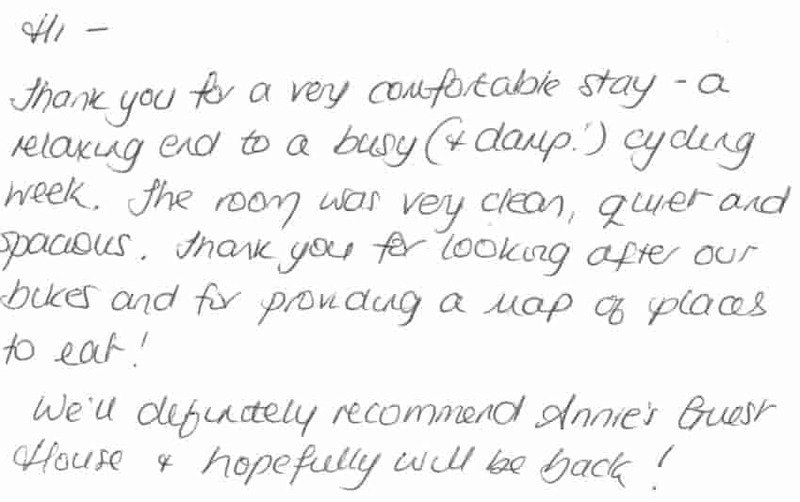 - Feedback from a guest who stayed in one of our standard single bedrooms for 37 nights whilst studying at Durham University. Thank you very much for my stay with you. I found my stay very good, the whole place was well presented and very clean. Allt he staff I met were lovely and friendly and as I was staying on my own I enjoyed my breakfast chats with Jean. I would recommend Annie's to my friends, thank you very much. 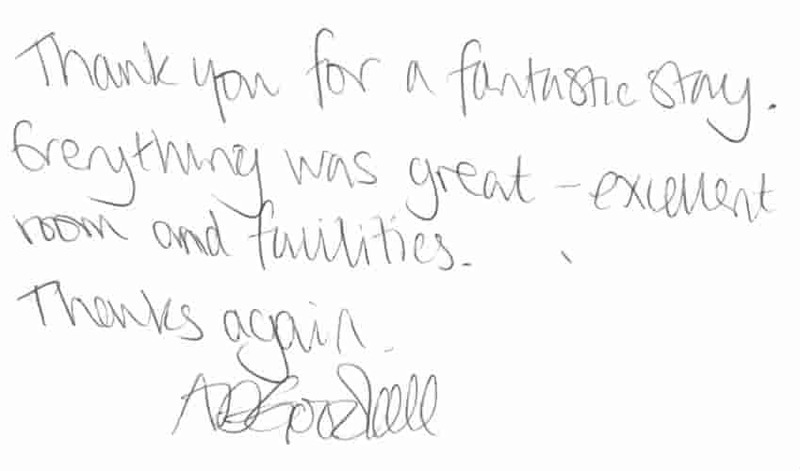 - Feedback from a guest who stayed for three nights visiting family in Newcastle upon Tyne. A very comfortable stay, thank you. Loved the size of the towels, so nice to have one big enough! June looked after us very well and her breakfasts are fab, beautifully cooked. Likely that there was plenty of drink supplies in the room. Good morning! Great guest house, I enjoyed my stay to the full. Will recommend to friends. Cheers. 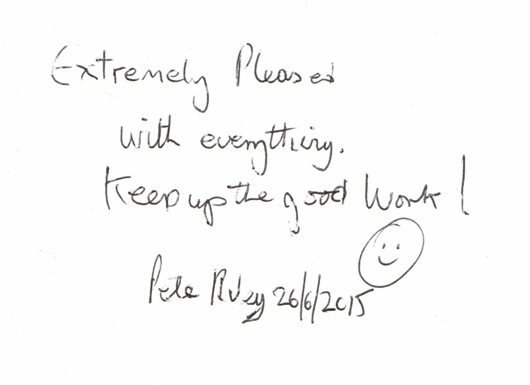 - Feedback this morning from a guest from Rio de Janeiro who stayed five nights whilst attending South Tyneside College, fifteen minutes walk from us. Fantastic sleep. Clean & tidy. Love those foam mattresses. Best sleep in a long time. Going home to buy 1 hehe. Thank you. Excellent. - Guest feedback after stay in one of our en suite triple bedrooms while attending a family party at the New Crown pub on Mowbray Road, South Shields ten minutes walk from us. We enjoyed our stay very much. Lovely place, good food! Thank you for everything. We look forward to come again some day. 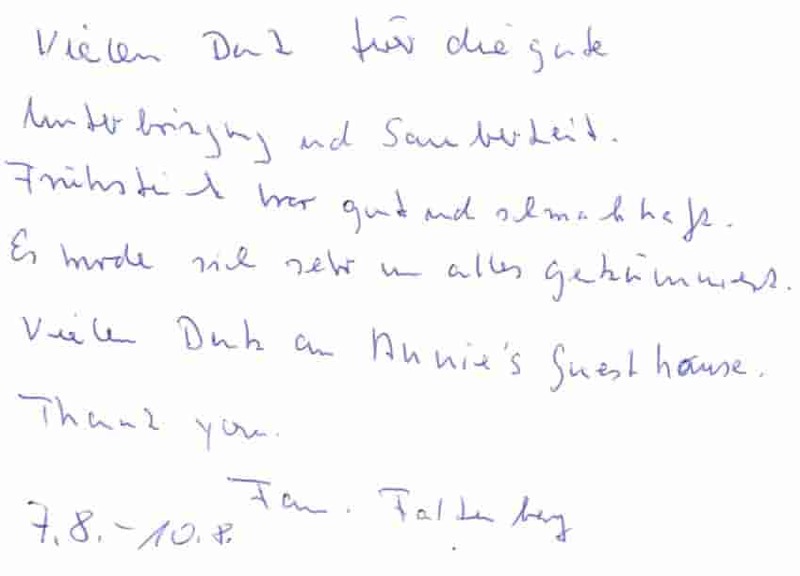 - Guest feedback from a German couple who stayed in one of our en suite double bedrooms for two nights whilst visiting Newcastle upon Tyne. Excellent stay thank you very much. Comfortable, clean and quiet. A great breakfast to start the day as well. Thanks again. 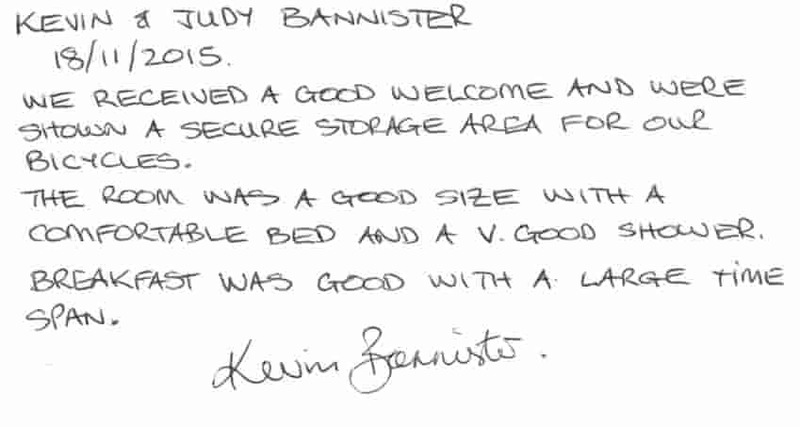 - Guest feedback from a repeat guest who stayed with us twenty nights whilst studying Marine Navigation at South Tyneside College, fifteen minutes walk from us..
We received a good welcome and were shown a secure storage area for our bicycles. The room was a good size with a comfortable bed and a v good shower. Breakfast was good with a large time span. 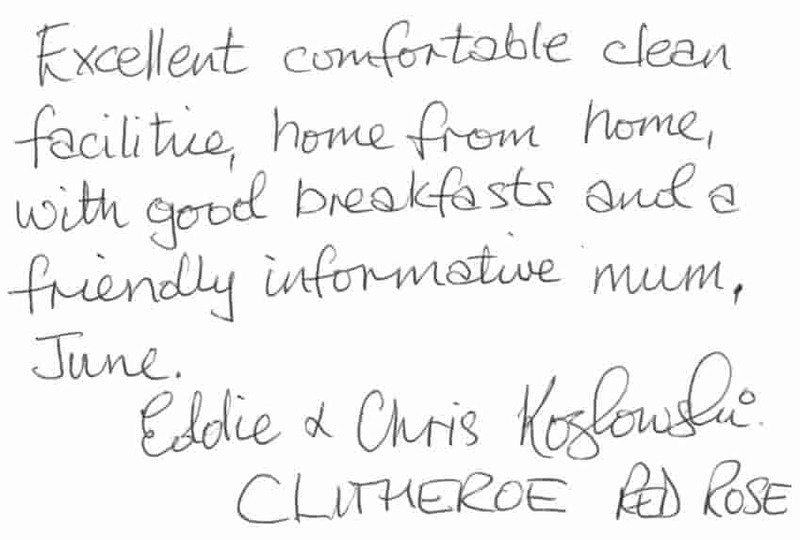 - Guest feedback from a couple on bicycles who stayed in one of our en suite double bedrooms. As usual, an excellent week. Room + bed very tidy + comfortable. Very friendly + highly recommended. 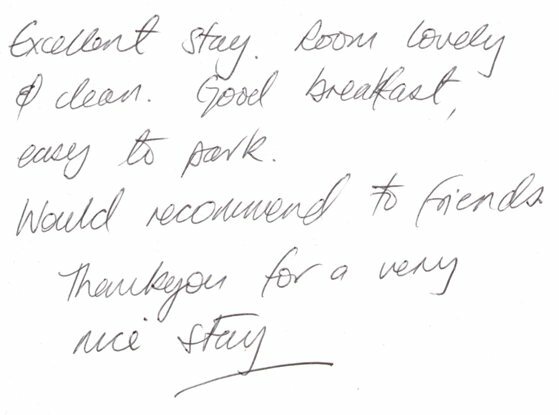 - Guest feedback from a regular guest from Bristol, his ninth stay with us, eight nights in one of our standard single bedrooms. The hotel and rooms are very clean. Beds are very comfy and the breakfast is lovely. I also love the bathroom. Wish mine at home was that nice. Yes would deffo return hoping to return next week. Thanks. - Guest feedback after a two night stay in our standard twin bedroom whilst working at the Barbour Factory Shop, Bede Trading Estate, Jarrow about five minutes drive from us. Excellent comofrtable clean facilities, home from home, with good breakfasts and a friendly informative mum, June. - Guest feedback after a two night stay in one of our en suite double bedrooms whilst visiting their son who is studying at Newcastle University. Room v comfortable & clean. Staff v friendly & welcoming. Good breakfast. Thanks for making wonderful stay. Great, clean rooms and wash rooms. Great value for money! Annie's Guest House was a really friendly place to stay. The room was lovely with tea + coffee in the room. Really nice breakfast. Thank you. Hi. Thank you for a very comfortable stay - a relaxing end to a busy (+ damp!) cycling week. The room was very clean, quiet and spacious. Thank you for looking after our bikes and for providing a map of places to eat! 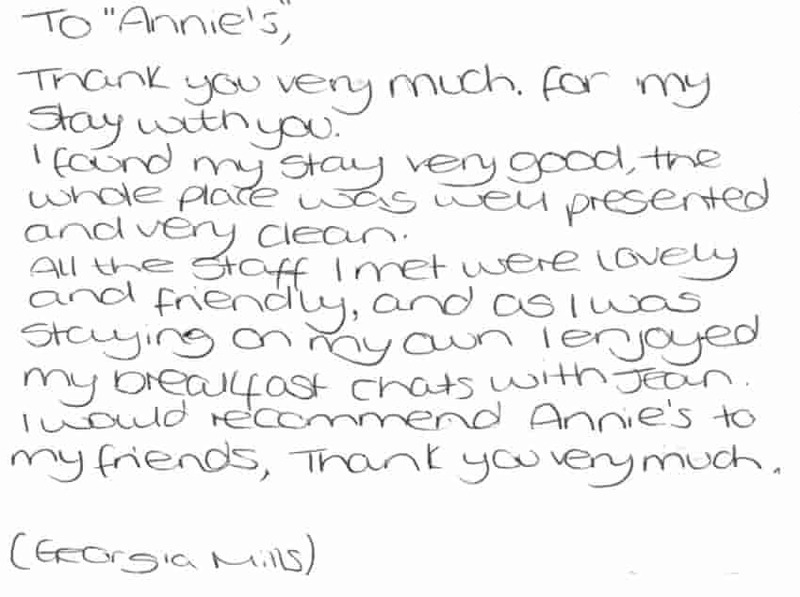 We'll definitely recommend Annie's Guest House + hopefully will be back! 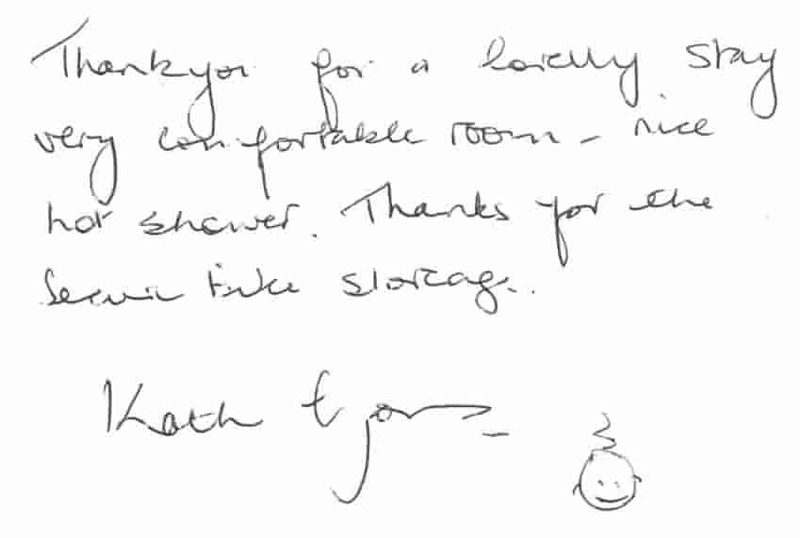 - Guest feedback from a mother and daughter who stayed in one of our en suite twin bedrooms during their cycling holiday. My second visit. Quiet and comfy. I will recommend and stay again. Thank you. 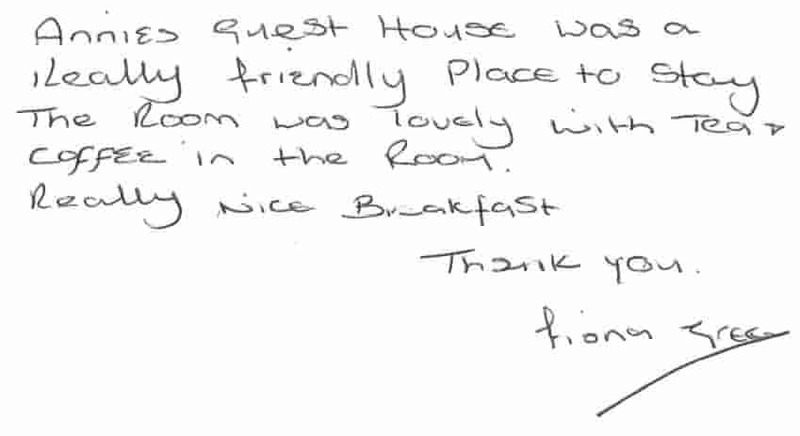 - Guest feedback from a family of repeat guests who stayed in our standard quad room for two nights. It is a really nice place to visit Newcastle's coast and the city. Well located near of Metro station. Clean room and good breakfast. I recommend it. - Online review left for us from four Spanish guests after a three night stay in our standard quad room. Thank you for a nice stay. Good breakfast, friendly staff, clean rooms. 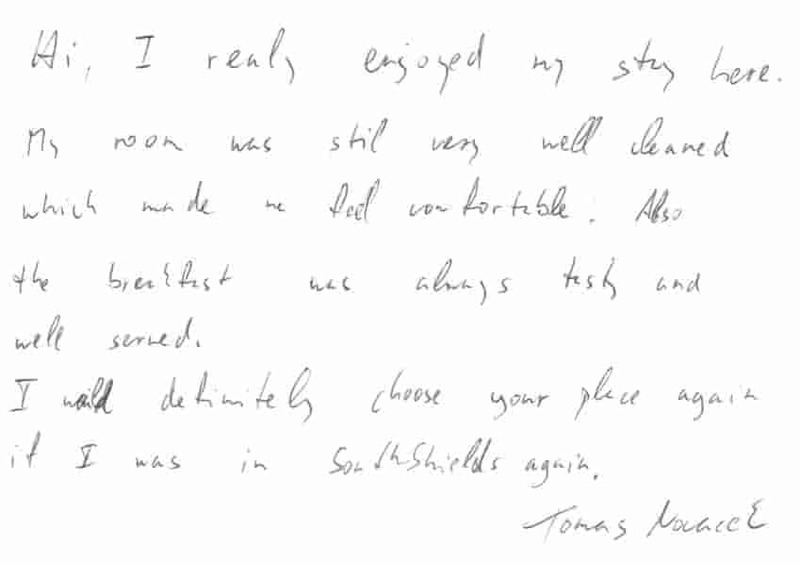 - Guest feedback from a Norwegian guest who stayed four nights in one of our standard single bedrooms. Everything lovely & clean. Beds really comfortable. Security system worked well - such a relief after a long journey & a late arrival! Thank you. 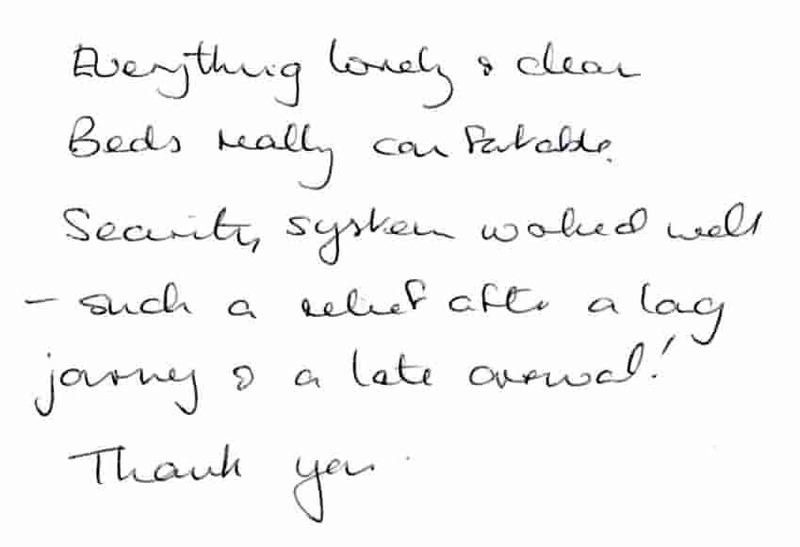 - Feedback from guests who used our free late self check-in option and stayed in one of our en suite triple bedrooms before attending Temple Park Leisure Centre five minutes drive from us for a trampolining competition. Deserves 10 out of 10. Nothing all was good. Breakfast is the best I have had in a bed & breakfast. 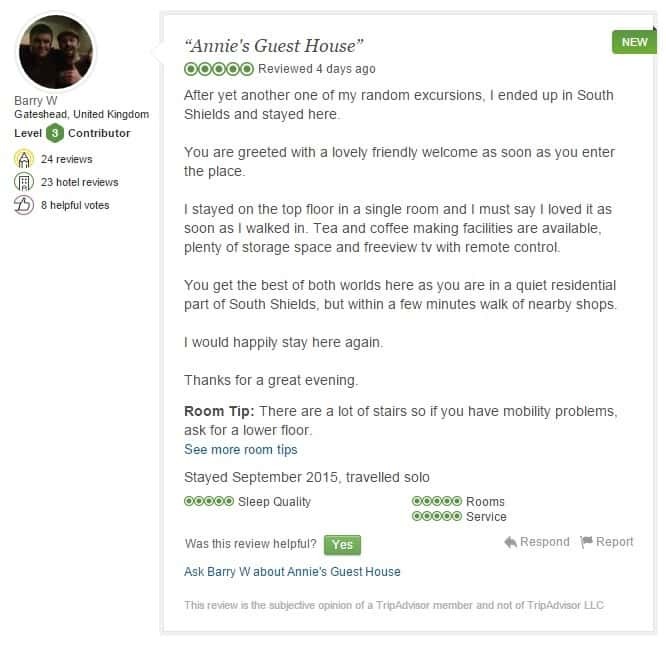 - Online review left for us after a stay in one of our en suite triple bedrooms. Thank you. The room + facilities v clean + well organised. Thanks again. PS Had a nice meal in Italian Stove. 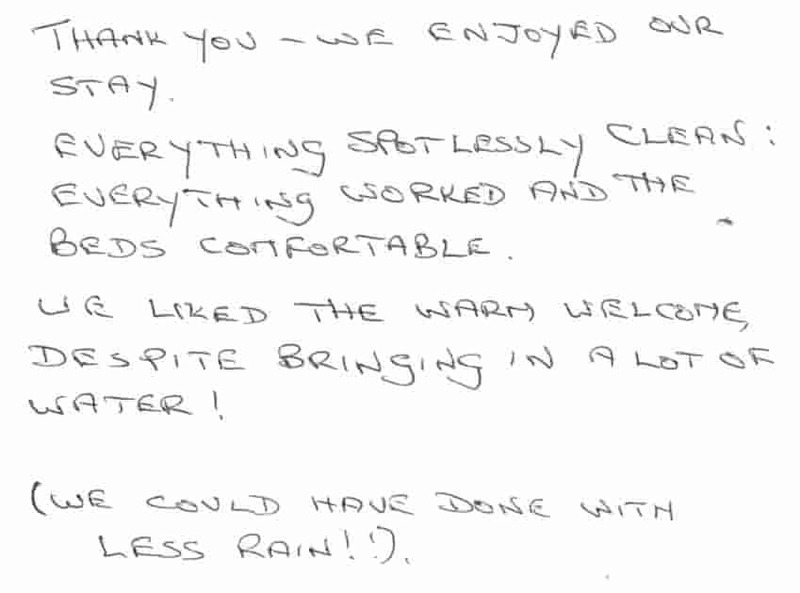 - Comments from a couple on bicycles who stayed with us after completing the C2C cycle route. Lovely place, very warm welcome + easy to find. Fantastic breakfast too! - Feedback from a father and daughter who stayed in one of our en suite twin bedrooms whilst attending a swimming competition at Haven Point Leisure Centre, five minutes walk from our guest house. Just what was needed, peaceful, clean, tidy & pleasant. A family trip for house hunting with a six year old, lovely stroll to the park & beach front. From booking to departure all easy & relaxed. We will be back if more house hunting. 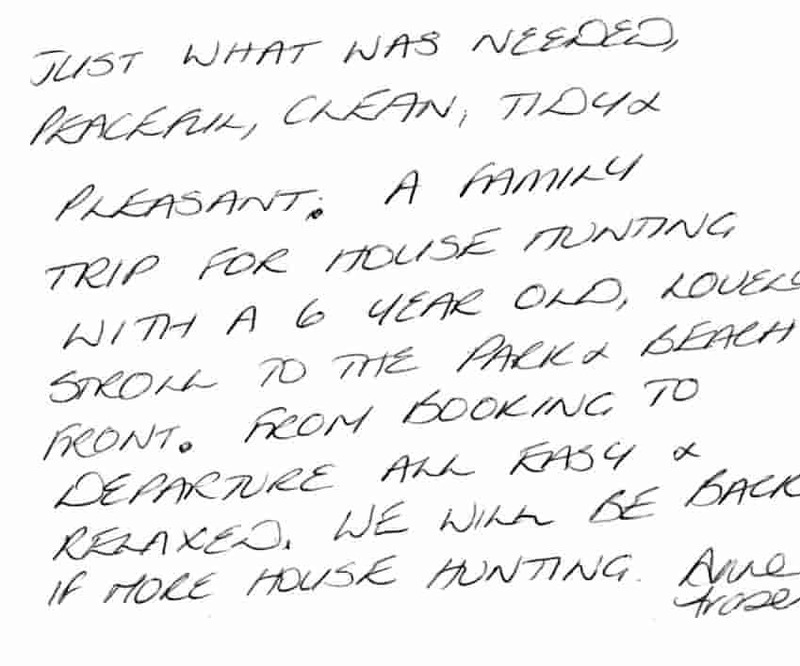 - Feedback from a family of five who stayed with us for three nights whilst house hunting in Gateshead. I enjoyed stay your B+B, good breakfast, good clean in bedroom, lovely bathroom + shower + clean. I glad woman who can BSL help me information. Many thanks. - Feedback from a Deaf guest who stayed with us for three nights and gave us a chance to practice our BSL (British Sign Language). Excellent accommodation. Will be back! Many thanks. 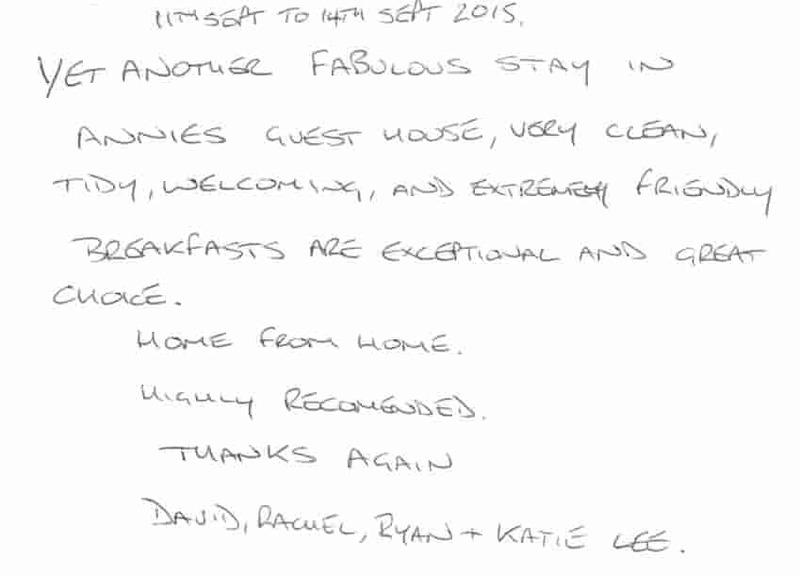 - Comments from a family of seven who stayed with us for three nights. Very helpful friendly place to stay. Great breakfast. My son and I enjoyed our stay. Rooms are a good size and comfortable. I can't think of any improvements required. Thank you. Hi, I really enjoyed my stay here. My room was still very well cleaned which made me feel comfortable. Also the breakfast as always tasty and well served. 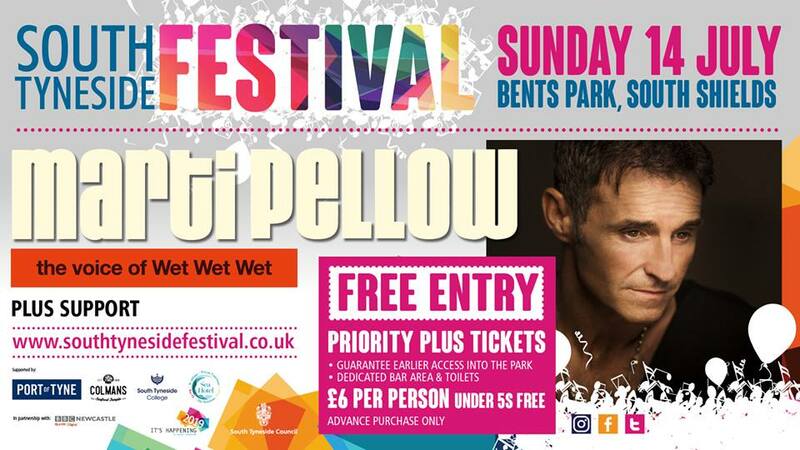 I will definitely choose your place again if I was in South Shields again. 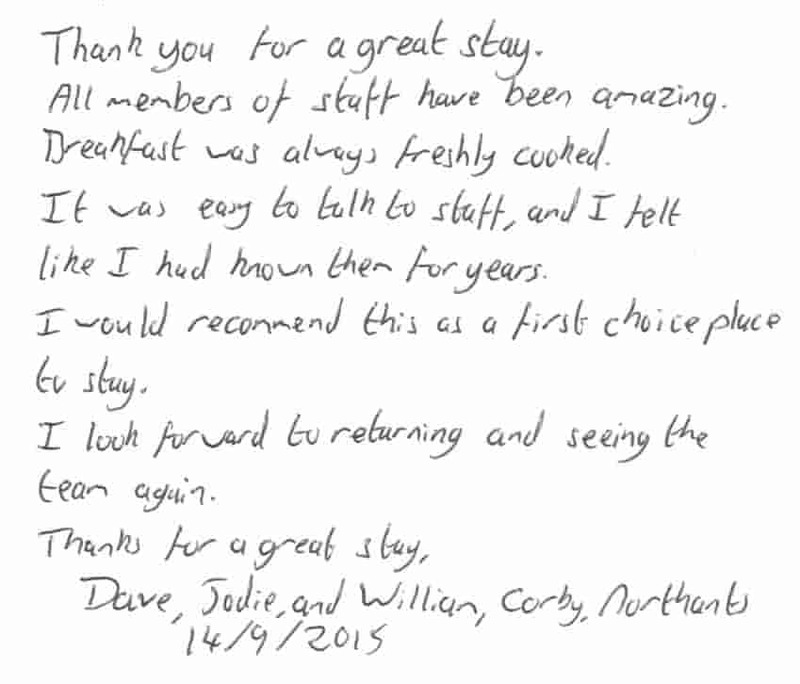 - Comments from a guest who stayed with us for nine nights whilst working in Roker, Sunderland. Annie's Guest House. After yet another one of my random excursions, I ended up in South Shields and stayed here. You are greeted with a lovely friendly welcome as soon as you enter the place. I stayed on the top floor in a single room and I must say I loved it as soon as I walked in. Tea and coffee making facilities are available, plenty of storage space and freeview tv with remote control. You get the best of both worlds here as you are in a quiet residential part of South Shields, but within a few minutes walk of nearby shops. I would happily stay here again. Thanks for a great evening. Room Tip: There are a lot of stairs so if you have mobility problems, ask for a lower floor. Hot breakfast. Lovely coffee. Room was comfortable and the 'extras' (toiletries, hankies etc) was appreciated. June looked after us well in the morning. Friendly, clean guest house. Would stay here again. 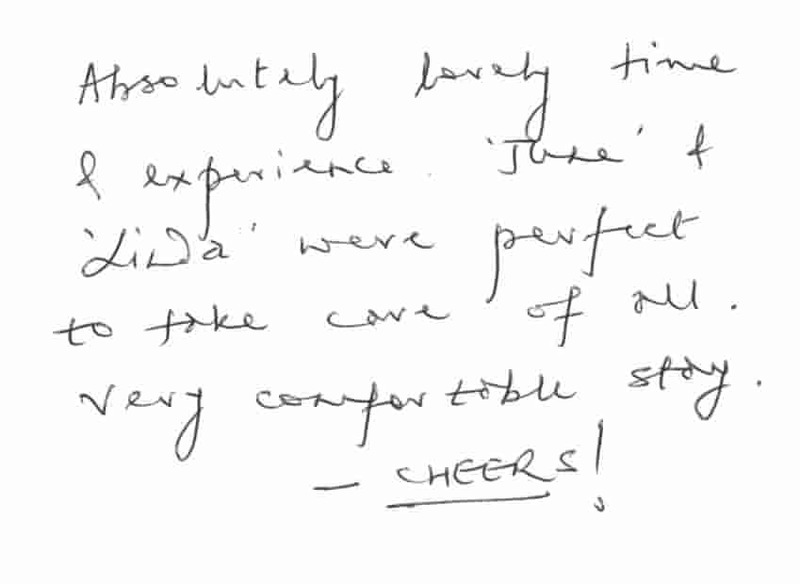 - Guest comments after a stay in one of our en suite double bedrooms before joining the Boudicca cruise ship at Port of Tyne for a sixteen night cruise to the Canary Islands and Madeira. Thank you for a great stay. All members of staff have been amazing. Breakfast was always freshly cooked. It was easy to talk to staff and I felt like I had known them for years. I would recommend this as a first choice place to stay. I look forward to returning and seeing the team again. Thanks for a great stay. 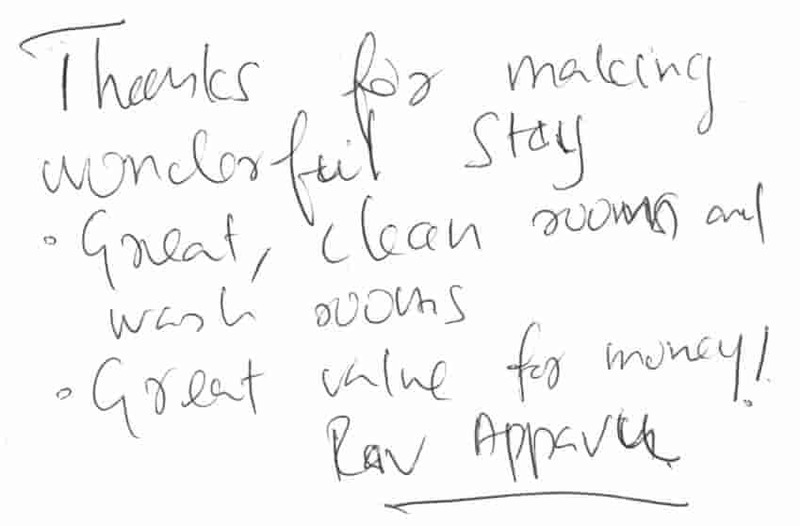 - Guest comments after a three night stay in one of our en suite triple bedrooms. Yet another fabulous stay in Annie's Guest House, very clean, tidy, welcoming and extrememly friendly. Breakfats are exceptional and great choice. Home from home. Highly recommended. Thanks again. 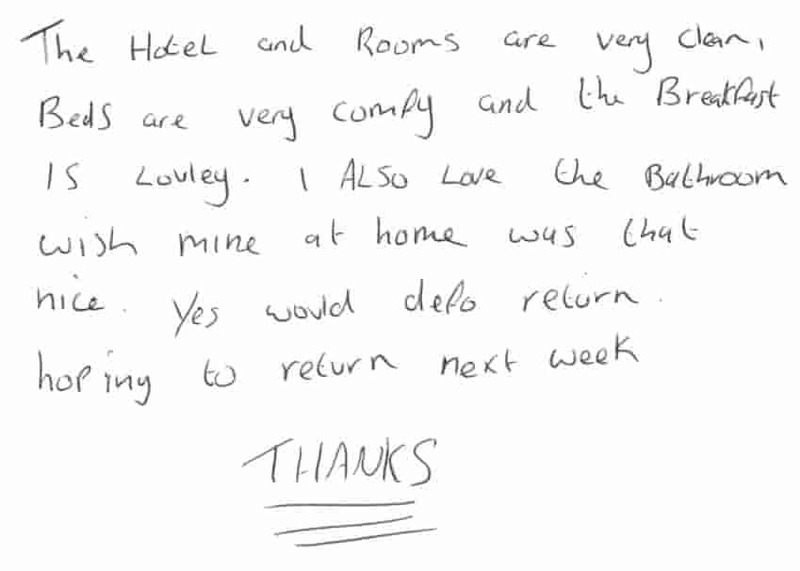 - Comments from a family of repeat guests who stayed in our standard quadruple room for three nights. Very very clean!! Friendly breakfast welcome, could not do more. Nice quiet rooms. I would happily stay here again and I would recomend to anyone. Thanks again. 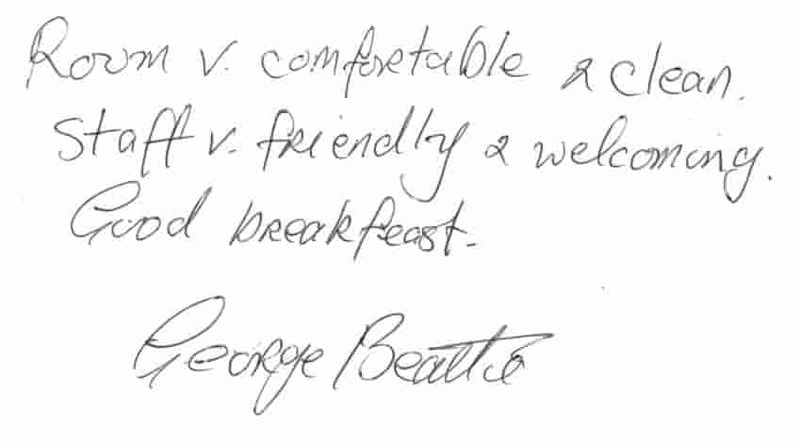 - Guest comments after a five night stay in one of our standard double bedrooms. Thank you - the room and facilities are lovely and very comfortable. We were delighted with everything. Wonderful greeting - lovely breakfast and very helpful. 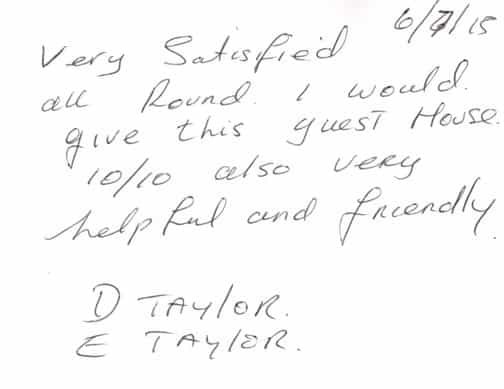 - Guest comments after a stay in one of our en suite double bedrooms before joining the cruise ship Boudicca departing from Port of Tyne's Northumbrian Quay for a nine day cruise to the fjords of Norway. I have only positive things to say about my stay at Annie's Guest House. Rooms, toilets, bathroom and dining room spotlessly clean. All staff very friendly and helpful. Would recommend and definitely stay again. 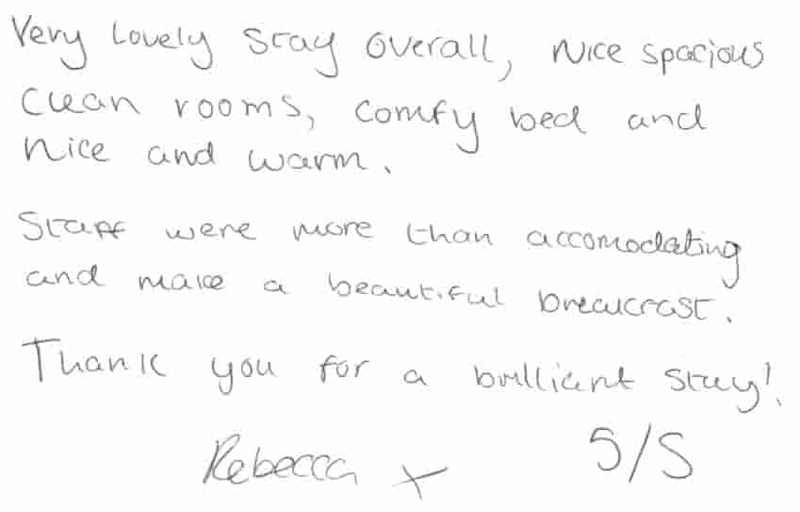 - Guest comments after a three night stay in one of our standard single bedrooms. Thank you for a lovely stay very comfortable room - nice hot shower. Thanks for the secure bike storage. - Comments from four female cyclists who stayed with us last night before starting the Coast & Castles cycle route from Newcastle upon Tyne to Edinburgh. Wonderful night. Lovely room. Great bed. Everything clean & tidy. Beautiful breakfast. Will stay again next time I'm in the area. Thank you!! 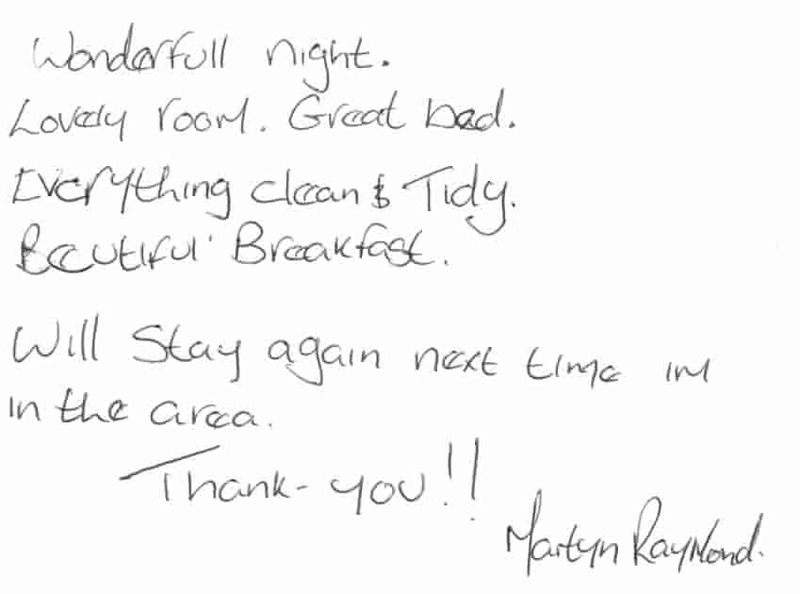 - Comments after a stay in one of our en suite double bedrooms. - Guest feedback from a trio of cyclists who stayed with us after completing the Coast & Castles cycle route (Edinburgh to Newcastle upon Tyne). Lovely stay , very good breakfast. Lovely to meet June what a treasure. Thanks. Thank you for a fantastic stay. Everything was great - excellent room and facilities. Thanks again. Really enjoyed my stay here, quiet, clean and peaceful - would definitely recommend it to my friends. Hope to return soon, great breakfast every morning. 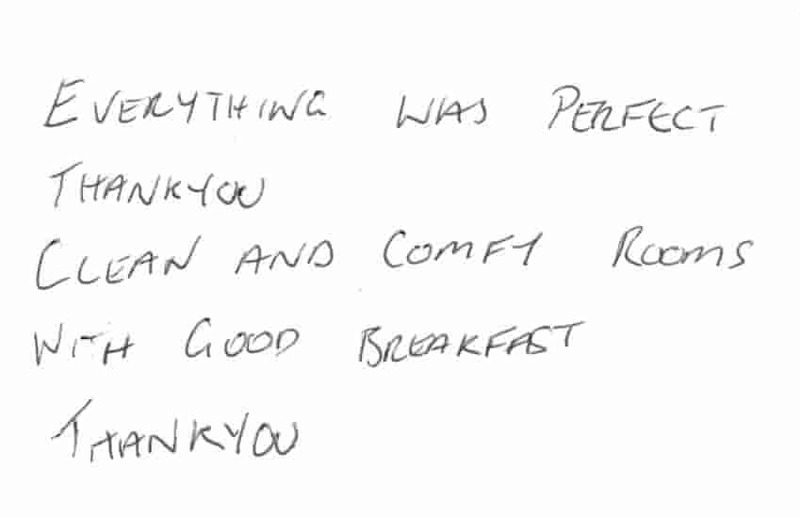 - Guest comments after a 46 night stay in one of our standard single bedrooms whilst training at Maersk Newcastle. We have really enjoyed our stay here even though it was only for one night. When we walked into our room we commented "This is what I like" it had everything we needed. The location was excellent for us and we enjoyed our relaxed brekfast. Many thanks. Thank you for everything. Lovely breakfast, nice lady. Hopefully we will visit again. Thanks again. 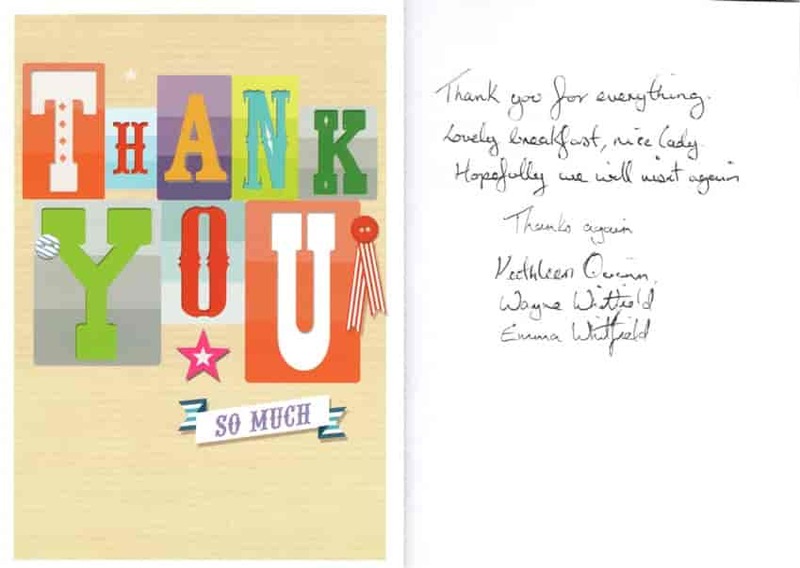 - Thank you card after a two night stay in one of our en suite triple bedrooms. Fantastic stay, only one thing wrong, not long enough!! Rooms exceptionally clean. Breakfast perfect, June is just lovely. Perfect for this place! Will definitely return. Thank you. 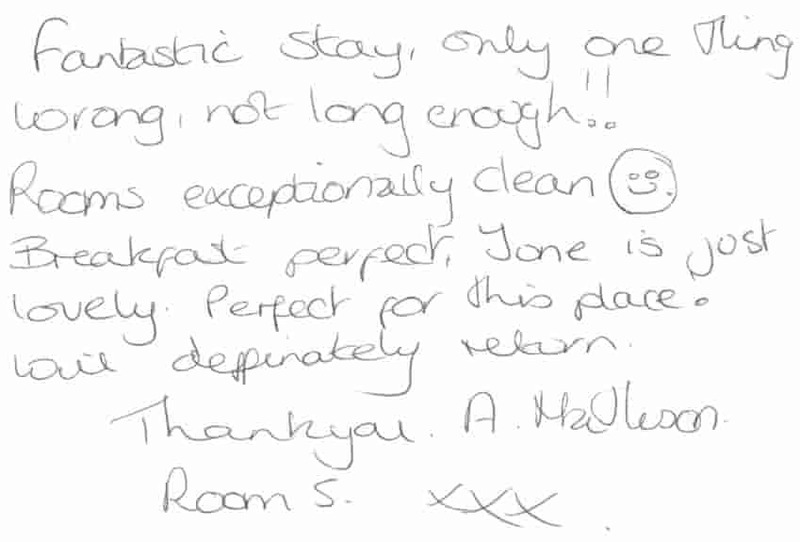 - Comments after a three night stay in one of our en suite double bedrooms. Fantastic stay, hospitality great, superb breakfast, room spotless, bed extremely comfy, everything spot on!!! 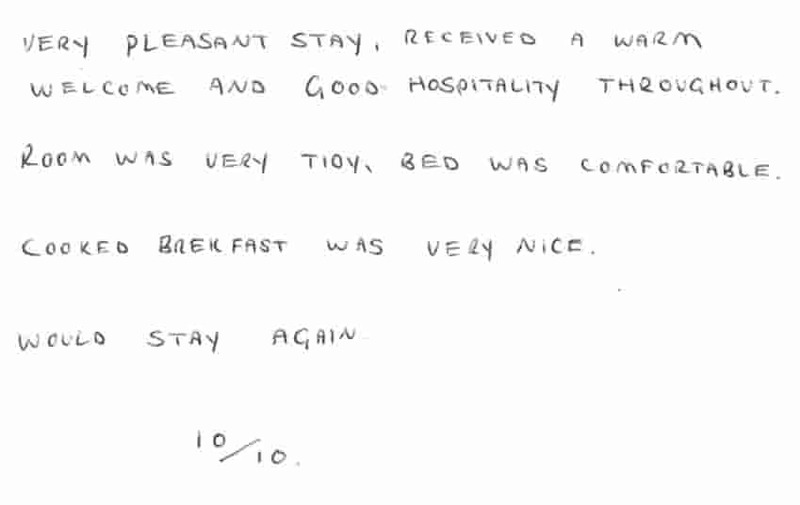 - Comments from guest after a six night stay in one of our standard single bedrooms. I did have a very good weekend at Annie's. I loved the breakfast and also loved to see the room every day cleaned! I also was surprised to use the fridge and microwave. Thanks a lot! 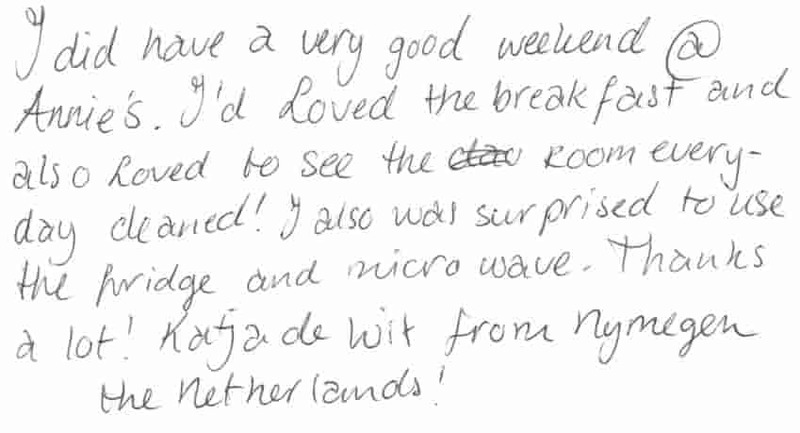 - Comments from guest from The Netherlands who stayed three nights in one of our standard single bedrooms. Thanks a lot for the nice accommodation and cleanlliness. Breakfast was good and delicious. They took a lot of care of everything. Many thanks to Annie's Guest House. Thank you. 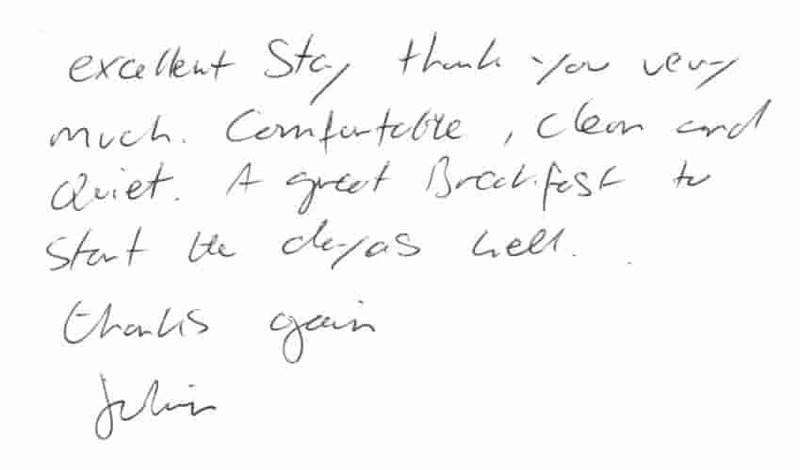 - Comments from guests from Germany after a four night stay in one of our en suite double bedrooms. Thank you for another lovely stay. The room is always clean & well kept. The facilities within the room are more than ample for our needs. We will visit again. 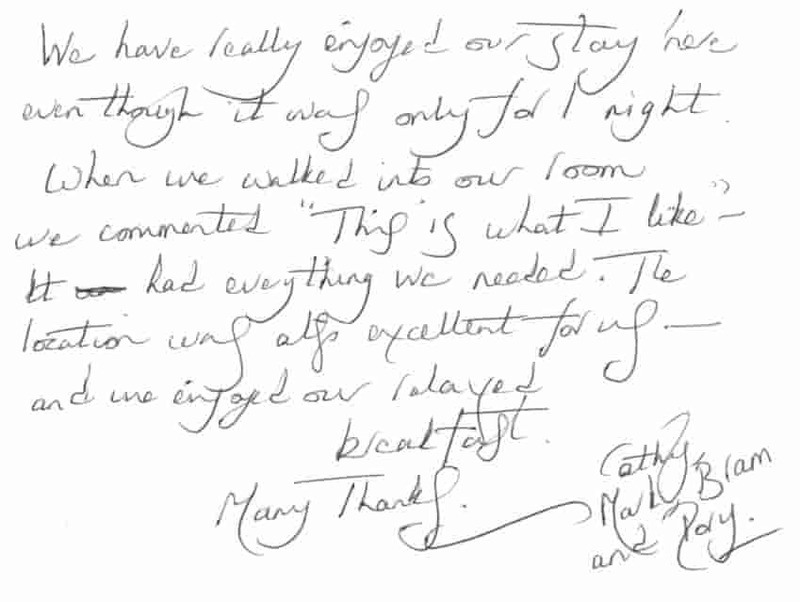 - Guest comments from repeat guests after a three night stay in one of our en suite triple bedrooms. Very happy I didn't have to worry about losing a key. Plenty of food for breakfast & delicious. Bed comfortable. Wifi great. Thank you! 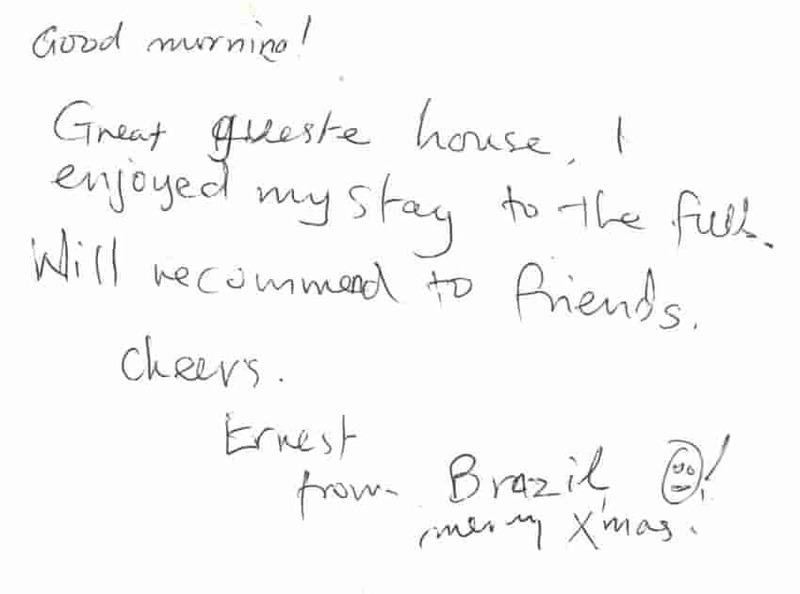 - Guest comments from an Australian couple who stayed in one of our standard double bedrooms. We have enjoyed our few days stay here and found everyone so friendly. Also we have been impressed with the cleanliness of our room. Lovely breakfast thanks to June. We would stay again. Thank you. Great stay. Very clean, excellent shower! Lots of coffee! Lovely breakfast. Thanks. 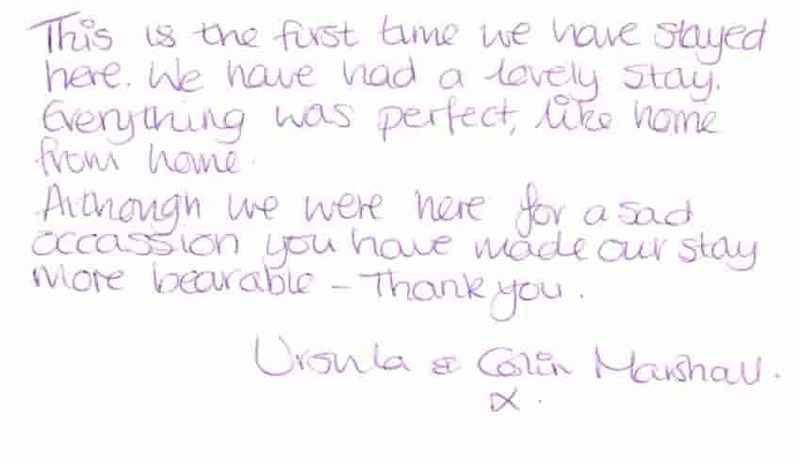 - Guest comments after a stay in our standard twin bedroom. Everything was perfect thank you. Clean and comfy rooms with good breakfast. Thank you. 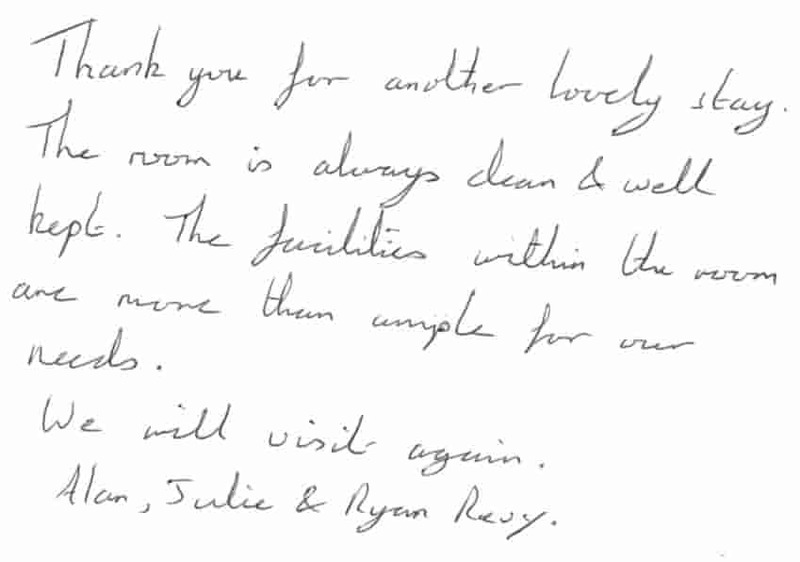 - Guest comments after a stay in one of our en suite twin bedrooms. This is the first time we have stayed here. We have had a lovely stay. Everything was perfect, like home from home. Although we were here for a sad occassion you have made our stay more barable. Thank you. 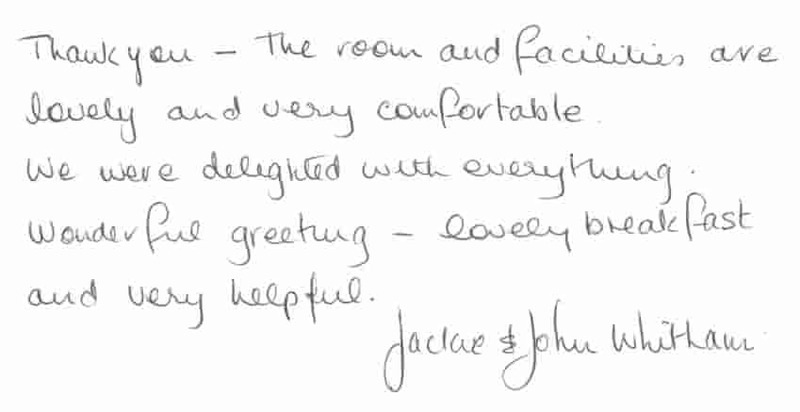 - Guest comments after a stay in one of our double en suite bedrooms this week while attending a funeral at South Tyneside Crematorium on John Reid Road. Absoluely lovely time & experience. June & Linda were perfect to take care of all. Very comfortable stay. Cheers! 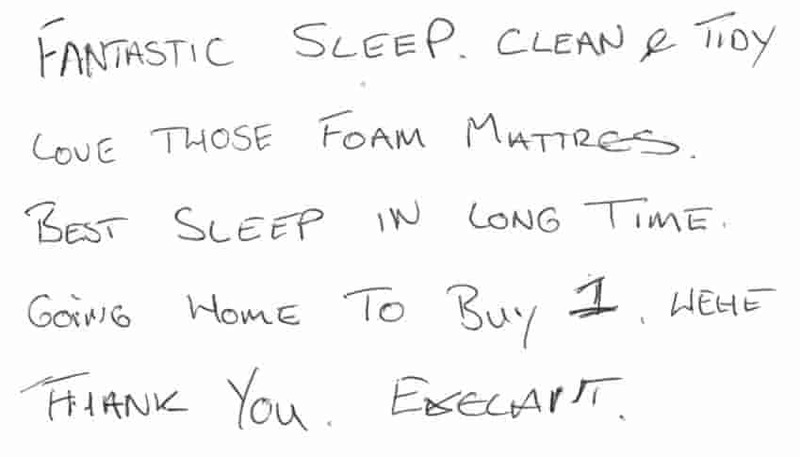 - Guest comments after a two night stay in one of our standard single bedrooms whilst working on King Street in South Shields. Very satisfied all round I would give this guest house 10/10 also very helpful and friendly. Positives. Friendly staff. Clean rooms. Good, tasty breakfast. Rooms feel secure with using the key code as opposed to using a key. Location is handy for the beach as well as town centre/Metro/ferry. Negatives/suggestions for improvement. None. 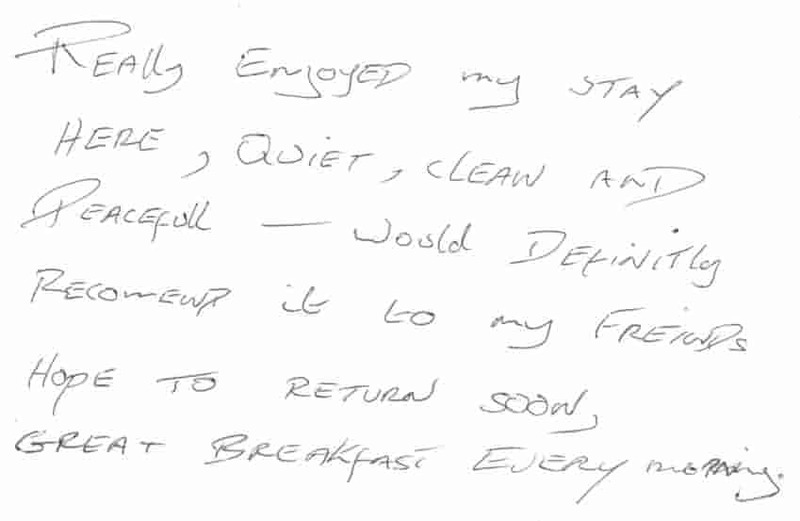 - Comments from a guest who stayed in one of our standard single bedrooms for three nights. 10/10 Few days stay over for work. Friendly staff and clean hotel with a nice breakfast to top off the stay. Extremely pleased with everything. Keep up the good work! 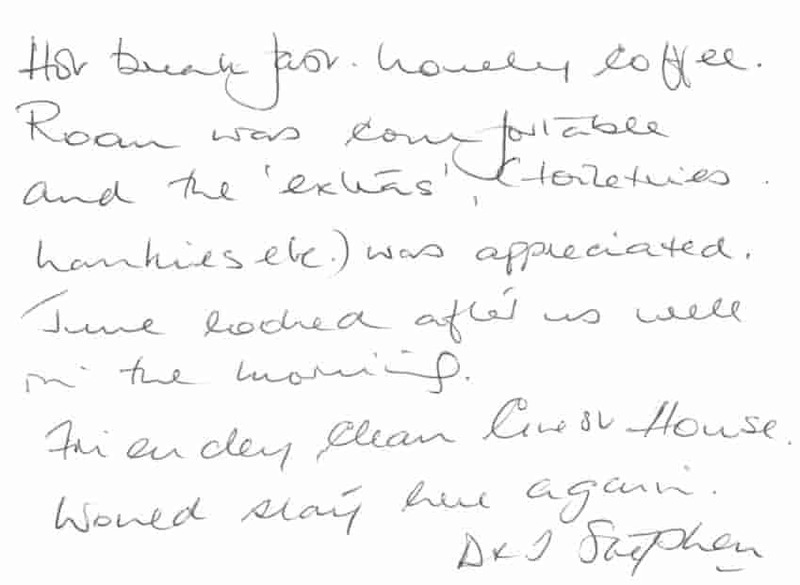 - Feedback from a guest who stayed in one of our en suite double bedrooms after completing the 174 mile Hadrian's Cycleway. 7.9/10 Worth Considering. Location is great, clean, tidy and welcoming. Boutique it isn't but you're not paying boutique prices. You can walk into town and to the beach in about 5 mins max!!! 10/10 Excellent stay. Very clean bnb. B+B very clean with friendly staff & lovely breakfast thanks for the stay. 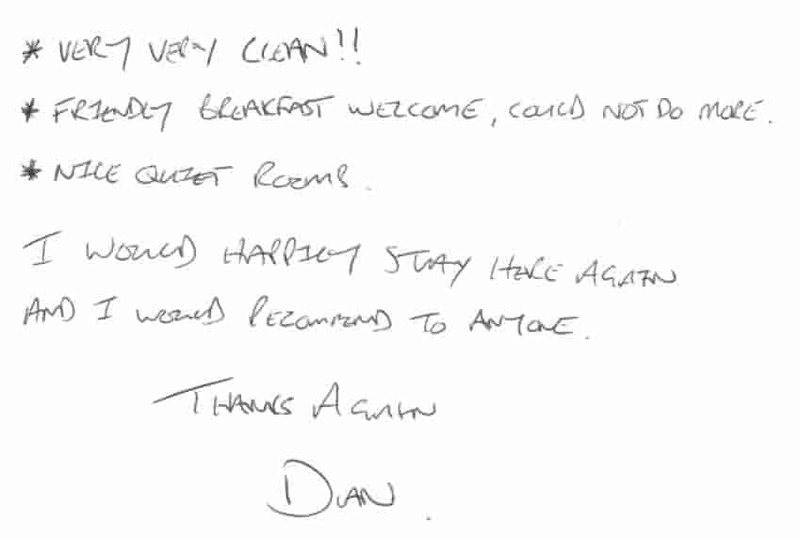 - Feedback from a guest who stayed in one of our standard single bedrooms. Excellent stay. Room lovely & clean. Good breakfast, easy to park. Would recommend to friends. Thank you for a very nice stay. 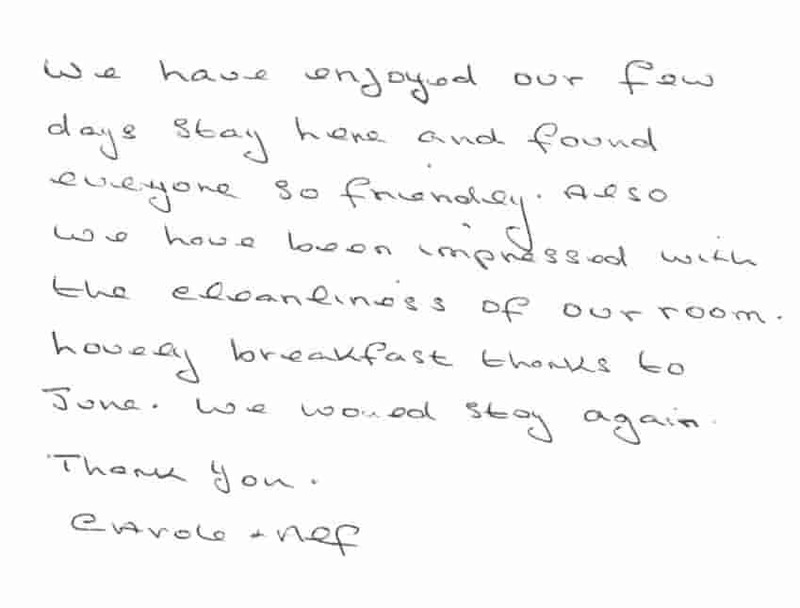 - Feedback from guests who stayed for three nights in one of our standard double bedrooms. 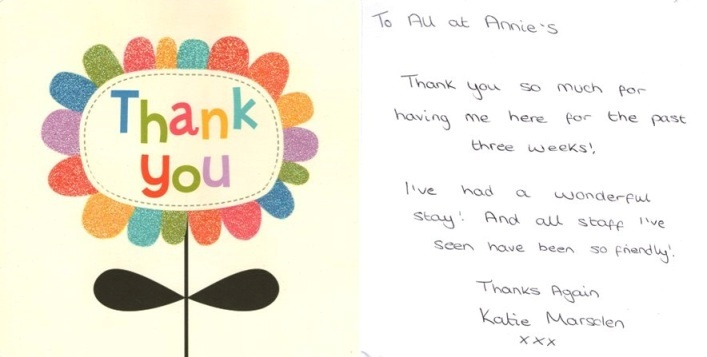 - Thank you card from a guest who stayed with us for three weeks whilst working at South Tyneside Hospital.